Last week we dove deep into the psyche of your ideal customer. … and of course, your solution! Or, if you sell a luxury item or a piece of art… the way your product inspires or delights your buyer. What videos are they likely watching on Youtube? • If you sell a custom dog mullet headband (yes, it’s officially the last time I bring it up), your ideal customer might be watching videos about how to dress up their puppy. • If you’re promoting your new single as an artist, your ideal customer/“fan” is probably watching videos from similar artists. Who are they? • If you’re a broker, your ideal customer could be watching videos about what to pay attention to when buying a new home. Again, this is about stepping into the mind of your customer and doing a little bit of “digging” into their psyche. What are they actually interested in right now? The better job you do at finding the right videos to show your ad in front of, the better your results will be. Since every MINUTE there are 300 HOURS of video uploaded to Youtube… we’re confident that there’s plenty to choose from! Now, when you’re about to get started with your first campaign you’re probably wondering about many things. “How does this video ad thing even work? How many videos should I target? And how many targeting groups? Why am I even doing this? In this post, I’m aiming to close some loops that might be running around your head on how to get things off the ground. 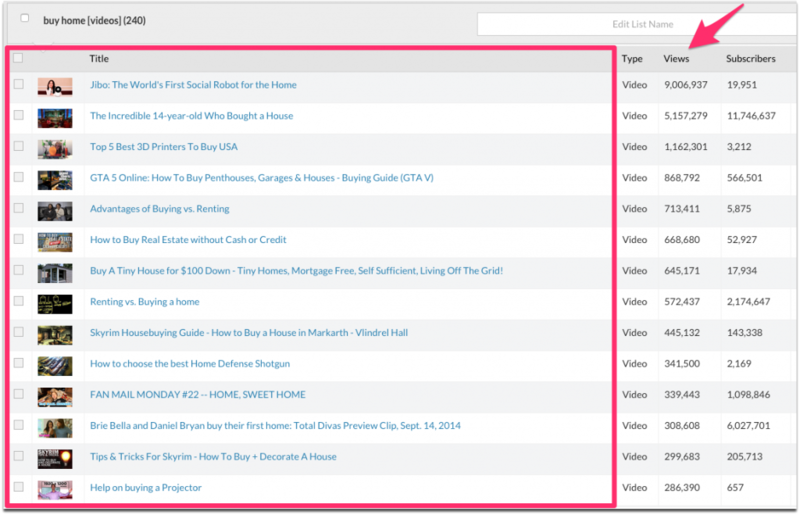 with 240 video placements links in each targeting list. In other words for 1 campaign, you try to gather a total of 2400 videos to place your ad in front of. (which is the current max. that AdWords has set, but depending on Google’s mood this could change tomorrow). Gathering as many placements as possible will increase your chances of getting more views. Now, we all know that more isn’t always better, of course! But with Veeroll you can have both (insert hallelujah sound) because you can easily gather thousands of links (quantity) that are really relevant to your audience (quality). If you’d have to do this manually… well let’s not even go there! There are tons of movie nights, playtime with your kids or other types of fun to be had in that time instead. So, let’s get ready for the first 2 steps of finding your targets in Veeroll. 1. Search for your target phrase. In your Veeroll dashboard go to the Target tab and type in your keyword. Don’t type in: “what to pay attention to when buying a new home”. 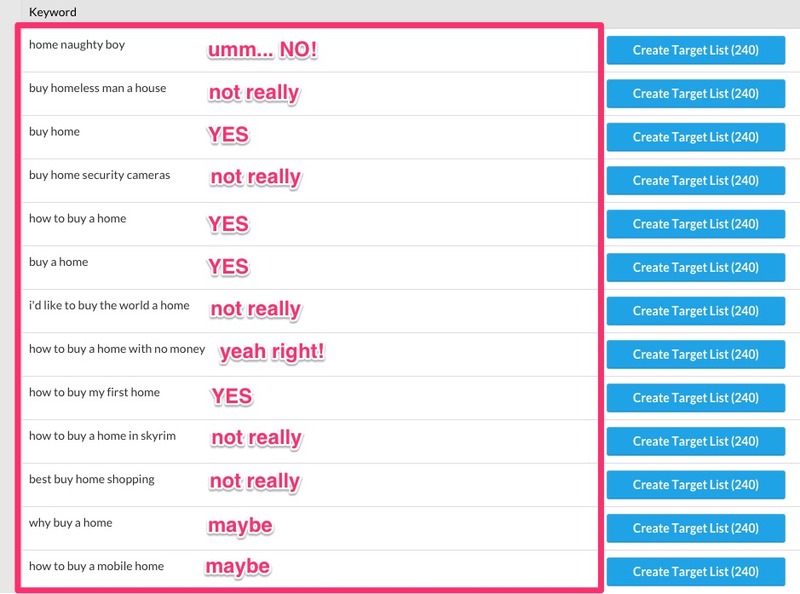 Do type in: “buy home” and see what the keyword tool automagically whips up for you. ‘Cause, even if you’ve done your research exceptionally well, there are still going to be certain phrases people search for that you wouldn’t have thought of yourself. This is why you should use only short phrases in this step and let Veeroll come up with the rest. After you see the results you can select “Get All” to find the number of views for the top 20 videos on YouTube for each of the keyword phrases. Then, click the top of the column on the right that says “Top 20 Views”. This will sort the list of keywords from most popular to least popular. Now it’s time to decide which keyword phrases best represent what your viewers are searching for, and save a list of 240 links for each of those keyword phrases. Keep in mind that you want to target as many placements as possible, but only the ones that are actually related. For example, in this case, you can clearly see which target lists are relevant and which aren’t. Also, keep in mind that you ideally want to target people that are willing to invest. Avoid targeting phrases with “ free” in it for example. In this case, it would be a good idea to skip the “how to buy a home with no money” phrase! 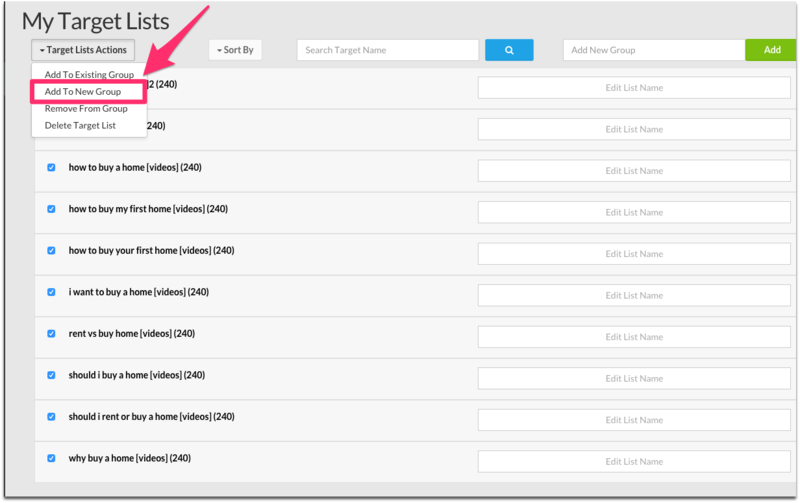 Hit the big blue button to Create Target Lists of only the RELEVANT keyword phrases. If you’ve selected 10 of them, boom! You’re done with step one. Are you still with me? Easy peasy right! 2. 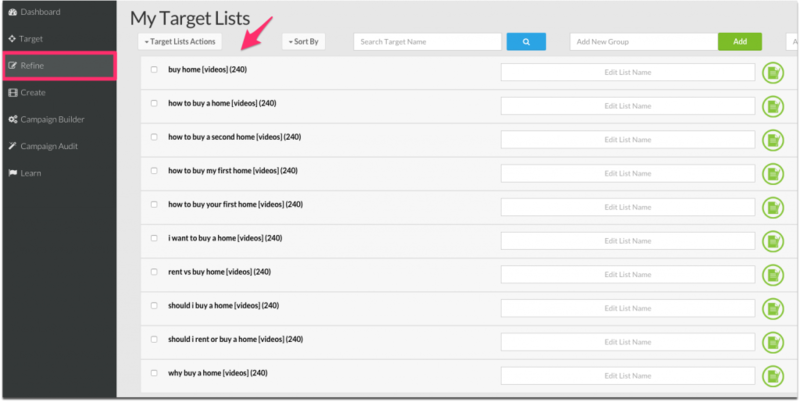 Refine your target lists. 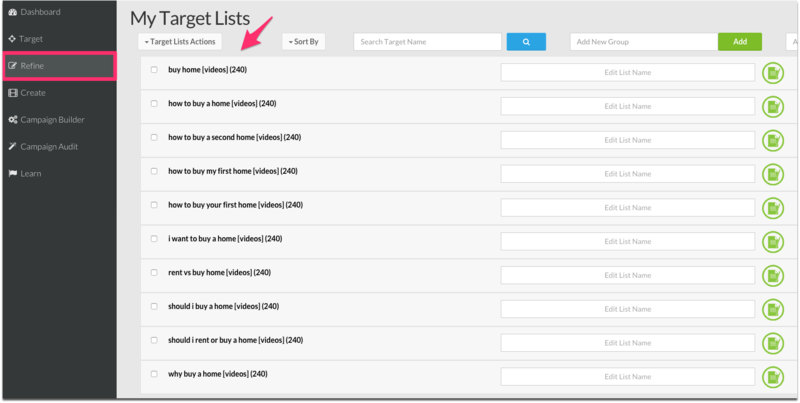 Click on the Refine tab, which is where you’ll find your 10 brand new targeting lists. To keep things neatly organized, it’s useful to create a group for each campaign you’re running. To do so, select your 10 targeting lists and choose “add to new group”. To keep things even more organized (can you tell I love organized?) give your targeting group the name of your initial search phrase. Which in this case was “buy home”. Now it’s time to start cleaning up your lists. In the Refine tab you’ll find a lot of options to do this, but to get started quickly we’ll focus on the most important one. For example, you could choose to remove videos with a low amount of views. However, if these videos were uploaded just one day ago they might not have gotten traction yet. Yet that doesn’t mean that they won’t go crazy viral tomorrow. For now, we’re just going to remove irrelevant videos with extremely high view counts. Click on your first list of placements to see all the videos on this list, and then click on Views to sort them. Please note that at the moment Veeroll finds all videos. This is because YouTube channels are free to switch monetization on or off at any time, and some videos could become monetized later. The first 3 examples in this list are probably not that interesting for you to advertise on. You’ll notice that the more you move down the list, the more targeted your videos will get. EDIT (05/13): Ideally, if you have time, you SHOULD try and remove all links that are not relevant, even if they have low view counts. But, If you want to get started quickly, don’t spend 3 hours nitpicking which one is right and isn’t and only remove the ones that are insanely popular + highly irrelevant. This is because it seems like AdWords gives preference to more popular videos, especially when the campaign is set to accelerated delivery. You can delete the videos individually by using the column on the right, or by selecting them and hitting the Bulk Delete button when you scroll down. There there! You’re ready to go create your video and build your campaign. Now, if you notice that almost all of the videos in your placement lists are irrelevant, it’s a good idea to delete that targeting list and try out a different keyword phrase. Don’t worry if you don’t find the right one right away. The Google Keyword Planner ; this keyword planner is for Google, not specifically for Youtube. But you could use it to get a sense of what popular Google phrases are, how many people search for these phrases every month, how much competition there is for these keywords etc. VidIQ ; this is a free Chrome extension that you can use to retrieve a lot of metadata for youtube videos. For example, you could use this to spy on your competitors a little bit and see which tags they are using in their videos. In many cases, you can get hyper targeted by not only selecting the right placements, but by combining this with geotargeting. You can do this in the Veeroll Campaign Builder (to country level) and even more specific in AdWords itself (by choosing only regions, cities or even a radius around the location of your company). Imagine if you’re a man in Miami looking for info on buying a new home when you get an ad that says “Hey, are you and your wife looking for a new home in Miami”? That’s totally freaky but possible 😉 But I’ll cover more on the topic of geotargeting later. At the end of the day, there’s no magic universal formula to build a perfect video ad campaign. One thing that we’ve learned from talking to several Youtube Ad Experts is that you simply have to test the heck out of it! (If you’re not a member yet, click here to sign up and get access to all the expert interviews). Once you get your campaign running and start to see data coming in, you will be able to see what is and isn’t working. You can then optimize your campaign in various ways, turn off placements that aren’t working, add new ones, etc. etc. But that in itself is a whole new series of blog posts! Do you have any more questions about targeting you’d like me to answer?